Sort of like creating a Honda Choir spot on your own, Verizon has launched Beatbox Mixer, a site, created by R/GA, that lets you combine various beatbox clips along with videos of the artists "performing" to support Verizon's "Richer, Deeper, Broader" broadband push. If one is so inclined, one can use the site's tools to create a customized, full blown sound and video extravaganza to play for one's grandmother who will then look at said creator like some sort of gastrointestinal alien was emanating from the bowels of said creator's stomach and quickly call the ambulance thereby calling into question the purpose for creating the thing in the first place. WTF? Where did that whole grandma thing come from? Who writes this crap? Anyway, we're sure this will appeal the the creative types out there who assume they, like Ashlee Simpson, can slide into fame's limelight on the coat tails of other's talent. And whoa! Where did that nastiness come from? Hmm. Oh wait. It must have been that morning trip to Dunkin where we had our "America Runs on Dunkin" latte and were C blocked from angling our way into a conversation with the beautiful, tiny but oh-so-plentiful up top beauty standing next to us in line. Oops. Looks like one of the windows on the new Frank Gehry-designed building for IAC/InterActiveCorp in West Chelsea was installed upside down and was noticed by Sugartown Creative whose offices are nearby. Of course, it's all just a promotional stunt to garner press for IAC/InterActive and/or Sugartown which we've just given them. Of course the PR person forgot to send us any links to these two companies and we are way too lazy to figure them out for ourselves. 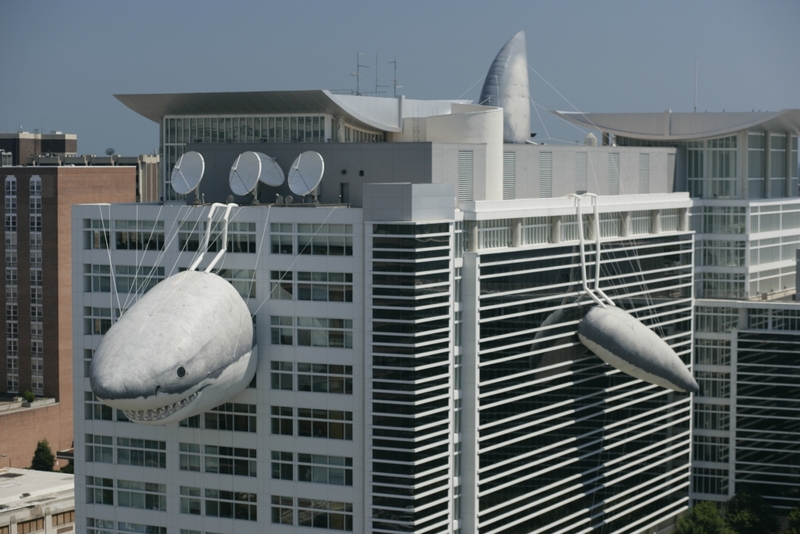 To promote its Shark Week, airing July 30 - August 4, Discovery Channel has hung a 446 foot long inflatable shark atop its Silver Spring, MD building. They're calling it the biggest Shark Week stunt ever. To accompany the inflatable, street teams with pun-filled names like Bight University Chewleaders, will roam the streets of New York. A team of surfers with surf boards will wander about apparently to create intrigue or to cause New Yorkers to wonder if The Day After Tomorrow or Deep Impact are coming true. Bight University Faculty members will quiz New Yorkers on their knowledge of shark fact and myth. If we have a choice, we'd rather be approached by the Chewleaders rather than some surfer dude or some pocket protector-wearing professorial type. Extending its foothold in the area of sweepstakes, Publishers Clearing House, that company with those people who show up at everyone's door except your own, has acquired Blingo, a search site that randomly hands out awards to people who visit the site. Blingo was launched in 2004 and has handed out 22,000 prizes since that date.